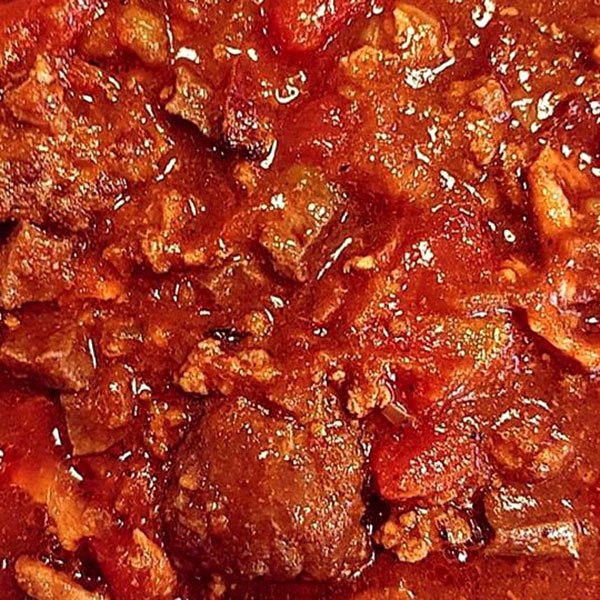 This recipe is a simple way to make a hearty beef heart chili on your stovetop or with your instant pot. Beef heart is an incredibly healthy and affordable meat. Heart is the highest food source of CoQ10 which great for energy and prevention of disease. Based on genetics, some people are less able to produce CoQ10, therefore heart is a great way to directly get this important nutrient. Heart is also very high in B vitamins, zinc, selenium and iron. Feel free to garnish with cheese, sour cream and tortilla chips. Yumm! Cut slice bacon into pieces 1 inch wide and cook in skillet. Drain and add bacon to pot. (Save grease). Drain ground beef and add to pot. Dice onion & celery & saute in hot bacon grease till soft, drain and add to pot. Peel & de-vein beef heart. Then cut into 1/4″ cubes. Add crushed tomatoes, tomato sauce, chilies & water to pot. Add lid to instant pot, set to sealing, & set manual for 35 minutes. After time is up, press cancel and serve.